At Traplight we value learning and sharing of information. We also believe that we have the best chance of making amazing games when everyone can give their input in our learning process. We organise company wide workshops several times a year to enhance our internal learning, and to update our collective understanding of how we make games. The topics of the workshops are tight to F2P design, understanding of the current mobile game market and the vision for Traplight’s games. The goal of the workshops is not to teach or share ready-made information, but to ask questions and find solutions together. The outcome of a single workshop can be for example game concepts, theories, presentations about findings or riveting discussions about the topic at hand. Game concepts are typically the most common outcome, as they enable us to understand complex issues from a very practical point of view. Our workshops involve all our employees regardless of job description. Putting our heads together to figure out how to best make games just makes sense: Collectively we can find ideas and solutions that would be hard for a single employee to find. The typical workshop starts with a creative brief that help us focus and get inspired about the topic at hand. After laying a common ground we divide into small teams. These teams decide independently how to tackle the topic, and what kind of tools and working methods to use. At the end of the day we will share what we have found. Another reason to organise these workshops beside learning together is to take a break from our routines. Little distance to our office environment and working together with people that are normally not in your team does wonders for your brain! We get to know each other better, tackle challenges head on with a tight schedule and jump into unknown without fear of being judged. And of course at the end we will have a very Finnish company party complete with sauna, hot tub and lake swimming. Below you can find some pictures of our latest workshop which we held on 6th of June in a cabin complex near Tampere. This time we learned together about player empowerment, and the different progressions that enable that in F2P games. We’ll post more about the topic in our blog later, so stay tuned! And finally, if you made it this far, enjoy this great .gif taken during the infamous hot tub malfunction incident at the workshop! 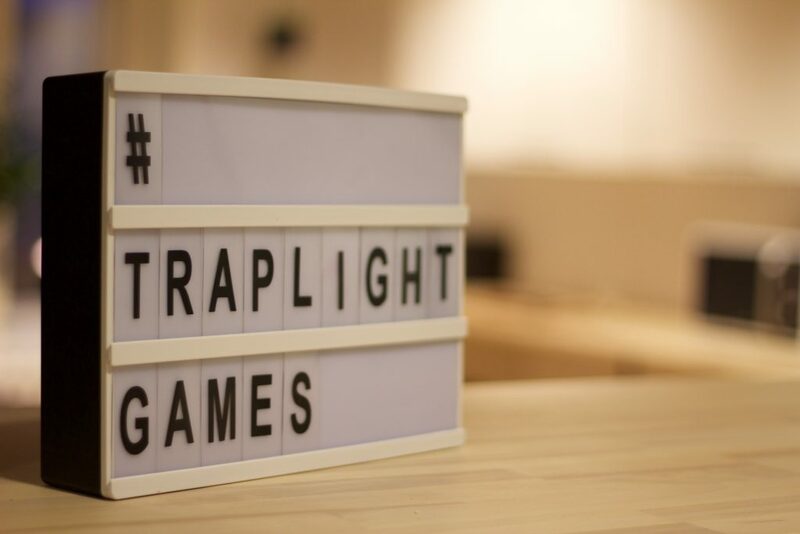 What makes Traplight a great place to work? We asked our staff what makes Traplight a great place to work. The answers varied from breakfast perks to having great people around, but one thing stood out very clearly: We love working at Traplight because of our strong user-generated content vision. According to the poll, it gives us ‘an exciting design challenge with extra difficulty’. We really enjoy creating games with the players, taking gaming to another level and seeing the things our players create. A clear, unifying vision is essential for a great work environment. However, a clear vision on its own won’t make a company appealing, if all basic stuff is not in order. Based on our experience we’ve gathered a list of things we feel a game company should have to be a truly great workplace for all it’s employees. This has already become sort of an inside joke: games companies need to have a great office, and there’s almost a competition on who has the coolest and most unique space. It’s no wonder though: we spend at least a third of our day in the workplace so we should feel comfortable there. We have invested in a central location and a creative, cozy and spacious office that fills all our daily needs from teamwork, design and big meetings to napping, gaming and relaxing. One of the things we gathered from our poll was that Traplight’s people love our office because ‘it feels like being at home’. In the morning we leave home, only to enter another. How cool is that! We included the whole company in the design process of our office and talked about what kind of an atmosphere we want to set. The end result is a place that everyone feels connected with and want to hang out in even after hours. On top of having a great physical space it’s also important to invest in perks. We have masseuse and other fun benefits, but according to the poll, our most liked perks are actually our Monday breakfast and our parties. Why? Because in these occasions we hang with each other and have great discussions. We start our week with a breakfast delivery every Monday, get everyone around the same table and have a relaxed meeting where we share our week’s goals. 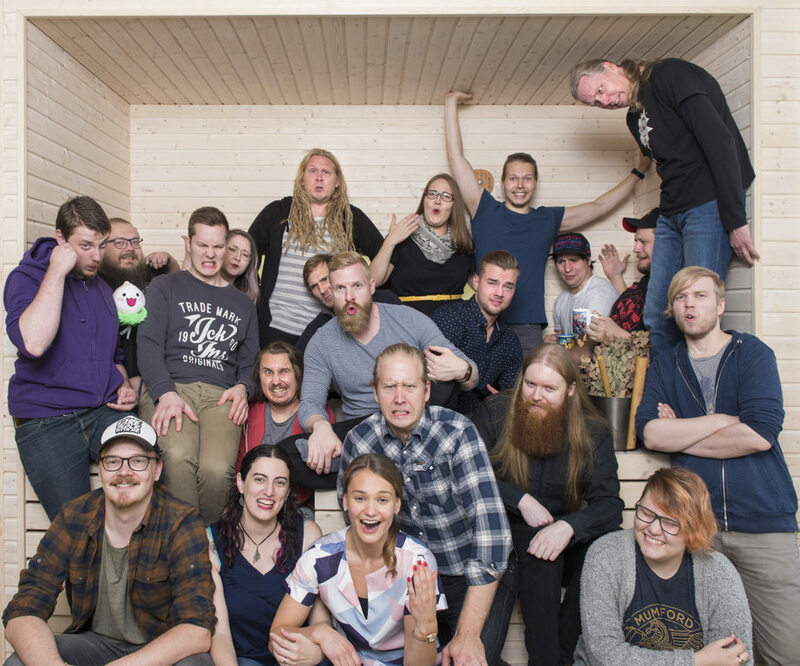 When asked what makes Traplight a great place to work, one of the most common answers relates to us as a group: ‘people’, ‘great colleagues’, ‘my co-workers’, ‘friendships’, ‘passionate peeps’ etcetera. Hiring the right people is really important, as we all know. Being a perfect fit for our culture and having social skills and the right personality are the most important things we look for in a candidate. You can always learn new skills needed for a specific position, but learning an open mind, communication and trust in yourself and your team are way harder. In a workplace where trust is at the centre of all interaction, people can be themselves and they trust others to accept each other as they are. Being yourself takes a load off your back and releases resources for more important things, like making awesome games! In a workplace like this you can also make mistakes. Through mistakes you learn, and learning makes you better at, guess what, making awesome games! We think that growing and learning are a part of work life as well, and they make coming to work every day more meaningful. People hanging out after work is not necessary, but it is a great sign. It means that the work community is knit together and it’s not just a group of people who work together. Based on the poll, we here at Traplight put high value in having real friends and friendships at the workplace. We have lots of hobbies and free time activities we enjoy with each other: doing sports, hanging out at the office after hours, having parties and get-togethers as well as playing online or tabletop games. Having the right environment and people are the basis of a good workplace, but the working habits are the thing that separate a well functioning company from a ragtag group of friends. At Traplight the cornerstone of our work are our small and autonomous teams that design their own schedules and roadmaps. Having a lot of freedom doesn’t mean no responsibility; the teams answer to the whole company and show their progress every week in our Friday Open Mic meetings. Through feedback, questions and help from others they make sure the project stays on target. Trust and respect were things that came up as one of the key factors why people like working at Traplight. We trust everyone to be an expert at what they do, and that they are always doing their best. In practice this means that ‘no one is watching over your shoulder as you deliver’. It also means ‘freedom’, ‘flexible rules’ and ‘mutual respect and appreciation of each others’ effort’. People taking leadership over their own and their team’s work is a result of building the company culture around trust. Out of all things that you need to build a great workplace, this is the hardest. It’s also the most important: A unifying vision that each and every person in the company can stand behind. The vision of a company should excite, give promise of an amazing future, and most importantly give a challenge. If there is no challenge, it means whatever the company is aiming to do has been done a million times before. At Traplight our goal is to crack the secret code of user-generated content gaming on mobile. It’s a great challenge that makes us all raise the bar for our effort. It is what gives Traplight it’s flavour, and what keeps us with the company through thick and thin. The intrinsic motivations that a unifying vision bring are the final touch needed to get from a ‘good working place’ to an amazing one.